A drizzly evening in deepest Staffordshire was brightened by a wonderful game of football which was unfortunate not to end in a goal-less draw. Lloyd Kerry's goal was the difference as Kidderminster Harriers ran out as 1-0 winners at the Scholars' Ground in Chasetown. A grounded cross from Callum Gittins was dummied by Matty Blair and Kerry composed himself before blasting a shot into the roof of the net. It was a slow start but the first chance fell to new signing Lee Morris. A Dave Hankin cross found its way to the back post but Morris failed to connect and the ball was cleared. From the clearance the ball was hoofed forwards and after Michael Briscoe's header failed to clear the danger a shot was powered towards the top corner, only for Danny Lewis to leap and push the ball away with his fingertips. This was a high point for Lewis, whose game slipped downhill quickly. After a series of kicking mishaps Lewis decided to charge out to deal with a through ball which Tom Sharpe and Chasetown's Gary Hay, formerly of the Harriers, were chasing. Instead of the more predictable hoof into touch, the 'keeper decided to use his hands to pull the ball in from outside the box. The free kick was teed up for and fired goalwards only for Tom Sharpe to head off the line. As the half progressed Harriers came into the game and enjoyed large spells of possession without any end product. First half side: Danny Lewis, Tom Sharpe, Mike Williams, Michael Briscoe, Tom Shaw, Mark Albrighton, Dave Hankin, Keith Briggs, Chris McPhee, Lee Morris, Jack Byrne. The second half passed by much like the first and only the final moments could excite the 221 crowd. Chasetown didn't have even a half chance, which I suppose is testament to a strong defence but it's more likely the product of poor attacking play. The Harriers dominated possession but got few attempts on goal. Finally in the 75th minute Kyle Hadley, of all people, managed to squeeze a cross into the near post which the Chasetown number eighteen managed to toe poke wide. Hadley had a chance of his own moments later when Callum Gittins' cross evaded heads from both sides but the rosy faced youngster's first touch escaped him for not the first time this pre-season and when he eventually regained possession he could only shoot straight at the goalkeeper. Gittins was again provider but this time the ball hit the back of the net. The left winger's cross was a confusing one for defenders - firstly it was driven along the ground and secondly Matty Blair dummied a shot which allowed the ball to roll through to Lloyd Kerry who took a nice touch before walloping the ball high above the goalkeeper into the top of the net. 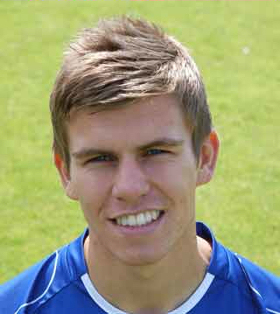 Readers may remember Kerry when he was with us on loan from Chesterfield last season. Harriers almost made it two as another Gittins cross was met at the back post by Blair and the goalkeeper made a fantastic save at point blank range to push the ball wide. Triallist Aaron Griffiths had the final chance of the game, a free header in the middle of the box which flew well over. Second half side: Andrew Stevens, Tom Sharpe, Mike Williams (Callum Gittings 56), Michael Briscoe, Lee Vaughan, Lloyd Kerry, Jack Byrne, Aaron Griffiths, Kyle Hadley, Matty Blair, Kevin Holsgrove.